Area music fans that enjoy pop/rock music with beautiful vocals, tasty arrangements, heartfelt emotion and a bit of classical music in the DNA are in for a treat over the next week. Yes, the iconic prog/symphonic rock band from England will be performing on July 31 at Sands Bethlehem Event Center (77 Sands Boulevard, Bethlehem, www.sandseventcenter.com/e). Then, singer/songwriter/vocalist extraordinaire Josh Groban will visit the area on August 3 for a concert at BB&T. In recent years, Yes has been visiting America during the summer months to perform shows featuring a couple of the bands classic albums performed in their entirety. Founded in 1968 by Chris Squire and Jon Anderson, Grammy-award winning recording artists Yes have created some of the most important and influential music in rock history, such as iconic pieces “Roundabout,” “Close to the Edge,” “I’ve Seen All Good People,” “Owner of a Lonely Heart,” “Starship Trooper,” and countless others. The group’s albums, including “Fragile,” “ Close to the Edge,” “Tales from Topographic Oceans,” and “90125,” have been certified multi-platinum, double-platinum, platinum, and more by the RIAA, and have sold over 50 million records total in a career that has so far spanned almost five decades. The 1980 album “Drama” — Yes’ 10th studio album — marked a new sound and more aggressive direction for the band with the use of modern keyboards and a vocoder. The album peaked at #2 in the UK and #18 in the US and features the single “Into the Lens.” Released as a double album in December 1973, “Tales From Topographic Oceans” is a concept album comprised of four interlocking pieces, ranging between 18 and 22 minutes. As the band’s sixth studio album, it reached #1 in the UK for two weeks — where it was the first UK album to qualify for Gold certification based on pre-orders — and peaked at #6 in the US. Following the album performances, the current Yes lineup — Steve Howe (guitar), Jon Davison (vocals), Alan White (drums), Billy Sherwood (bass) and Geoff Downes (keyboard) — will also perform a selection of the band’s greatest hits. “For the past few years, we’ve been doing these album series tours each summer,” said Downes, during a phone interview Wednesday morning from a tour stop in Columbus, Ohio. In 1980, pop duo The Buggles (keyboardist Geoff Downes and singer Trevor Horn) acquired Brian Lane as a manager. The pair had had a worldwide hit with the single “Video Killed the Radio Star” and were working in the same rehearsal complex as Yes. The duo already had a song called “We Can Fly From Here,” which they thought would be suitable for Yes and which they consequently pitched to the band. At this point, the departure of Jon Anderson and Rick Wakeman, which had been kept secret from everyone outside the Yes inner circle, was revealed to Horn and Downes and it was suggested that they join Yes as full-time members. Horn and Downes accepted the invitation and the reconfigured band recorded “Drama,” which was released in August 1980. The record displayed a heavier, harder sound than the material Yes had recorded previously. “Tales From Topographic Oceans” is one of Yes’ iconic classics. The tour hit a recent snag but was not derailed. The trek will proceed as originally announced in light of the health update issued yesterday (7/18) from drummer Alan White, who recently underwent a successful surgery to repair an injured disc in his lower back. As White noted in a letter penned to the fans on www.yesworld.com, with rest and physical therapy, he will be rejoining the band as soon as physically possible. Until then, White’s good friend Jay Schellen will sit in and perform with the band. The show at Sands Bethlehem Event Center will start at 7 p.m. Tickets are $45, $55 and $65. Josh Groban will bring his “Josh Groban: On Stage Tour” to the BB&T Pavilion (1 Harbour Boulevard, Camden, New Jersey, 856-225-0163, www.livenation.com) on August 3. He is touring in support of his Gold-certified album “Stages,” which was nominated for a 2016 Grammy Award for Best Traditional Pop Vocal Album. “Stages,” which is the seventh studio album by Groban, consists of favorite songs from Broadway musicals. Some of the featured tracks are “What I Did for Love” (from “A Chorus Line”), “Bring Him Home” (from “Les Misérables”), “Over the Rainbow” (from “The Wizard of Oz”) and “You’ll Never Walk Alone” (from “Carousel”). “This is an album I had in the back of my head since I was young,” said Groban, during a recent phone interview from a tour break in Los Angeles. Groban’s first album was a self-titled disc released in 2001. His first four solo albums have been certified multi-platinum, and he was charted in 2007 as the number-one best selling artist in the United States. He has entertained fans across the globe with his multi-platinum albums and DVDs (over 35 million sold worldwide), electrifying live performances, and comedic film and television appearances. Co-incidentally, Groban is headed to Broadway later this year. “Natasha, Pierre & The Great Comet” will open on Broadway this fall, starring Josh Groban as “Pierre’ and Denée Benton as “Natasha” in their Broadway debuts. Created by Dave Malloy (“Preludes,’ “Ghost Quartet”) and directed by Rachel Chavkin (“Small Mouth Sounds,” “Preludes”), the show will open at Broadway’s Imperial Theatre on October 18. The musical “Natasha, Pierre & The Great Comet” is billed as “a theatrical experience like no other”. Malloy’s inspired adaptation of a 70-page slice of “War and Peace” puts the audience just inches away from Tolstoy’s brash young lovers as they light up Moscow in an epic tale of romance and passion. “Back when I was recording ‘Stages,’ I didn’t know that I’d be going to Broadway,” said Groban. “I love this role. It’s going to be a really nice feather in my cap. ‘Natasha, Pierre & The Great Comet’ was an Off-Broadway show that now is totally transforming the Imperial Theatre into a Moscow supper club. Video link for Josh Groban — https://www.youtube.com/watch?feature=player_embedded&v=61DiWi00d2w. The show at the BB&T Pavilion will start at 7:30 p.m. 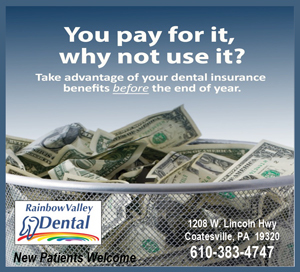 Ticket prices range from $28-$152.50. He will also be performing at the Borgata in Atlantic City on August 5. Last year at the World Café Live, Wrembel brought his special “Django A Gogo 2015: Made in France” show to Philly as one of the few stops in the North American tour. It was a tribute to gypsy guitar legend Django Reinhardt. 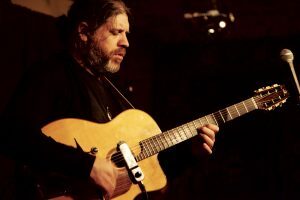 On July 30, Wrembel will perform with his band at The Venetian Social Club (8030 Germantown Avenue, Philadelphia, 215-380-2588, http://www.hotclubphilly.com). This show is hosted by the Hot Club of Philadelphia as part of the Chestnut Community Concert Series. On “Dreamers of Dreams,” Wrembel channeled all of his musical influences and blended them with his experiences in Africa, Asia, Europe, Central America and the United States to create a musical adventure into the realm of dreams. “In my live shows now, it’s just my music,” said Wrembel, during a phone interview Monday afternoon from New York, his adopted hometown for th3e last 16 years. “At times, I do play some Django. “The Philadelphia show will be something different. It’s acoustic — a trio with two guitars and bass. I love to do the trio thing with the acoustic side of the music. It is a history of Django’s music in chronologic order. Born in Paris and raised in Fontainebleau, home of impressionism and Django Reinhardt’s music, Wrembel was classically trained in a music conservatory starting at age four. His life took a decisive turn in his late teens when he first discovered the music of Django Reinhardt and the Gypsies. He spent the next ten years of his life learning, playing, and expanding on this musical tradition. This hard work gave Wrembel the technique, but the time spent playing around the campfires and trailers of the Gypsies gave him the soul — both necessary ingredients for him to master his art form. Wrembel has done a lot on his own to keep Reinhardt’s music alive. Several years ago, he staged a tribute show in New York called the Django A Go-Go Festival. The event was a huge success and has become an annual event in Manhattan. In 2011, Wrembel took the show on the road – including a visit to the Philadelphia Museum of Art. “I learned the music of Django in France – in gypsy camps near Paris,” said Wrembel. “I learned it the traditional way — by being with the people and hearing the music being played. The music brings people together. Video link for Stephane Wrembel — https://www.youtube.com/watch?feature=player_embedded&v=aUnBY8PNB8U. The show at the Venetian Social Club July 30 will start at 8:30 p.m. Tickets are $22. With Philadelphia being the city where the first female presidential candidate was nominated, it seems only fitting that there is some great music by female acts being performed live in the area this weekend — Garbage and Kristin Kontrol at the Fillmore, Joan Jett and Heart at the BB&T Pavilion and Sarah Jarosz at the Ardmore Music Hall. On July 30, Kristin Kontrol will open for Garbage (fronted by Shirley Manson) at Fillmore Philadelphia (1100 Canal Street, Philadelphia, 215-309-0150, www.thefillmorephilly.com). Kristin Kontrol is the new project from Kristin Welchez –formerly known as Dee Dee, leader of the internationally-acclaimed rock band Dum Dum Girls. Dum Dum Girls was Welchez’ guise for the best part of a decade. After posting her bedroom recordings online, she caught the ears of Sub Pop, assembled a group of badass, black-clad cadets and toured the world. Over the course of three albums, four EPs and numerous singles, Dum Dum Girls morphed from the “girl group gone band” to a plush noir-pop group. Last year, Welchez put the name Dee Dee in limbo, reassumed her given name Kristin and recorded a killer album titled “X-Communicate” with producers Kurt Feldman and Andrew Miller. “I wanted to finish an album the way I wanted and then do shows,” said Kontrol. “Instead of guitar, this time I was writing on keyboard. I wrote about 40 songs that I then abandoned. I realized I was trying too hard to write differently. So, I went back to writing on guitar. It was liberating to be able to do what I wanted to do. After the last Dum Dum Girls record, I knew I wanted something that wasn’t more of the same. I had reached a ceiling about how far I could go with Dum Dum Girls and have people accept it — how far you can go when you have a band that is locked in an aesthetic. With Dum Dum Girls, I knew what I could do within the parameters and I remembered that. With the new project, it took awhile until I figured out what I was trying to do. It was about including all I wanted. With my current landscape, there is a lot of crossover in genres. Video link for Kristin Kontrol — https://youtu.be/I6KvbQoOy3A. The show at the Fillmore, which features Garbage as the headliner, will start at 9 p.m. There are a lot of female-fronted rock bands these days. In addition to the two acts at the Fillmore, there are acts such as Sleigh Bells, Tegan and Sara, Pretty Reckless and the Mynabirds — to name just a few. 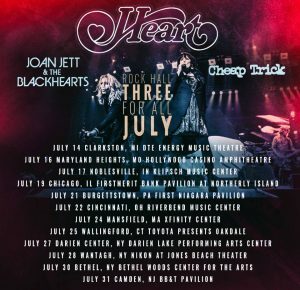 One thing they all have in common is how much they owe their existence to the two acts that will be performing at the BB&T Pavilion on July 31– Joan Jett and Heart. These acts featured females fronting male bands — Ann and Nancy Wilson in Heart and Joan Jett. These were ladies who could not only sing, they could rock as hard — or harder — than their male counterparts. Both were major factors in the 80s era of the MTV-fueled music scene. How hard did they rock? They rocked in the 1980s and they’re still rocking now. And, they’re still rocking as hard as any band out there — without testosterone. The show at the BB&T Pavilion, which also feature Cheap Trick, will start at 6:30 p.m. Tickets range from $25.25-$100. 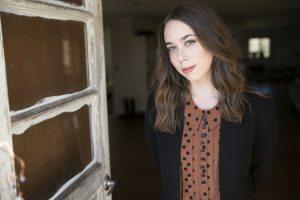 If you want to go out on July 31 and hear a female singer whose music is more on the softer side, consider the show by Sarah Jarosz at the Ardmore Music Hall (23 East Lancaster Avenue, Ardmore, 610-649-8389, www.ardmoremusic.com). Jarosz as earned her credibility in the world where contemporary folk, Americana and roots music intersect. She is a talented multi-instrumentalist (mandolin, octave mandolin, guitar, and banjo), an expressive and distinctive vocalist, and an accomplished songwriter. She has been nominated for multiple Grammy awards including two from her third album “Build Me Up From Bones,” as well as several Americana Music Association Awards. Jarosz just released “Undercurrent,” her fourth album for Sugar Hill Records. “I picked up mandolin when I was nine and I got obsessed with it,” said Jarosz. “Later, I also started playing guitar and banjo. I had heard mandolin on records from my dad’s collection and always liked the sound. “I saw a music video for Nickel Creek at CMT and that made me really want to get a mandolin. A family friend lent me a mandolin to play. I liked it so much that my parents bought it from them and gave it to me as a Christmas present. “Early on, it was bluegrass. I went to a weekly bluegrass jam in Wimberley. I fell in love with the people, the community and the music. It took me a year or two to get proficient on mandolin — being obsessed and practicing non-stop. My earliest influences were Nickel Creek, Tim O’Brien and Gilliam Welch. Jarosz, even when a student, still found time to record her own albums and get involved with side projects. 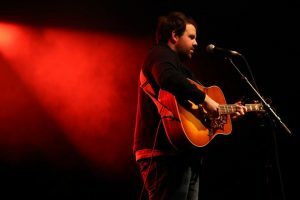 “With ‘Undercurrent,’ I took some time off after touring a lot and working on other projects like I’m With Her and ‘A Prairie Home Companion,’” said Jarosz. Video link for Sarah Jarosz — https://youtu.be/ofNDjpsVtYw. The show on July 31 will also feature Donovan Woods as the opening act. JUNO Award-nominated singer/songwriter Donovan Woods will release a deluxe edition of his fourth album, “Hard Settle, Ain’t Troubled,” in the United States on August 12. The critically-acclaimed album recently garnered a 2016 Polaris Music Prize nomination, an award given to the best full-length Canadian album based on artistic merit and selected by a panel of music critics. Featuring 10 original compositions, the deluxe edition includes four live tracks recorded as part of a live show at the Harbourfront Centre Theatre. “I started recording the album last July,” said Woods, during a phone interview Tuesday afternoon from Toronto. “I made the album at a studio in Toronto called The Lincoln County Social Club. 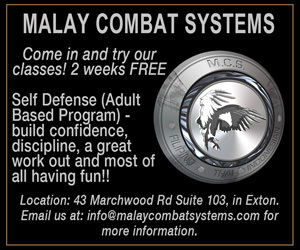 “I moved to Toronto after growing up in Sarnia, Ontario. Now, I’m living in both Toronto and Nashville. I had been going to Nashville for a week every month for a few years so I decided to get a place of my own there — especially since I got a publishing deal with Warner Chappell Music. Woods’ first album, “The Hold Up,” was released in 2007. His song “Brand New Gun” was featured in the movie “Numb” starring Matthew Perry. His song “Wait and See” was featured on “Degrassi: The Next Generation,” and his song “My Cousin Has a Grey Cup Ring” was used in commercials for the Grey Cup. His second album, “The Widowmaker,” was released in 2010, and his third album, “Don’t Get Too Grand,” came out in 2013. Woods’ song “Portland, Maine” (co-written with Abe Stoklasa) has also been recorded by Tim McGraw. His song “Leaving Nashville” (also co-written with Stoklasa) has been recorded by Lady Antebellum singer Charles Kelley. “I grew up with country music and gravitated back to it — with a little more Americana,” said Woods, who also grew up playing the uniquely Canadian sport of curling. Video link for Donovan Woods — https://youtu.be/HlHYoqKSZkk. The show at Ardmore Music Hall on July 31 will start at 7:30p.m. Tickets are $22 in advance and $26 day of show. The house will be rocking on August 2 at the Keswick Theater (291 N. Keswick Avenue, Glenside, 215-572-7650, www.keswicktheatre.com) when then venue in Montgomery County presents a show featuring George Thorogood and the Destroyers with the Mike Eldred trio as the opening act. Recorded at Sun Studio in Memphis, “Baptist Town” is steeped in the rich history of the South and the folklore that is so important to American culture. The catalyst for the record is the small neighborhood outside Greenwood Mississippi where legendary blues guitarist Robert Johnson was murdered in 1938. The track “Somebody Been Runnin’” references the final chapter of Johnson’s “deal with the devil” made at the crossroads — and some say fulfilled — in the tiny community of Baptist Town the night he died. The record also focuses on the poverty and racism of the past, and still existing in the Deep South today. Baptist Town remains mostly as it did in Johnson’s time and offers a stark contrast to the surrounding city of Greenwood, Mississippi. “We recorded ‘Baptist Town’ in June 2013,” said Eldred, during a phone interview Wednesday afternoon as he travelled from Phoenix, Arizona to Irvine, California. “It took a long time to come out because we were looking at labels to put it out. We got turned down a lot. They had too much on their plates and told us we weren’t a widely-known band. Sun Studio is a legendary studio in Memphis that was owned by Sam Phillips. The long and impressive list of acts that recorded there includes Elvis Presley, Howlin’ Wolf, Johnny Cash, B.B. King, Roy Orbison, James Cotton, Carl Perkins, Rufus Thomas and Jerry Lee Lewis. “We were only in Sun two days,” said Eldred. “You can’t record there during the day because they have tours. You have to go in during the evening, set up, track until dawn and then take down. “I produced the album and the engineer was Matt Ross-Spang. He’s been working there for awhile. Certain areas of the room just sound different. It depends where you stand. There’s no isolation. We all played live. You can’t play loud — even though it sounds loud. Video link for Mike Eldred Trio — https://youtu.be/KSLzFBpSEdk. The show at the Keswick will start at 8 p.m. Tickets are $49.50 and $69.50. Dominick Farinacci, who will be performing on August 3 at South Jazz Parlor (600 North Broad Street, Philadelphia, http://www.southrestaurant.net/), is one of America’s top young jazz trumpeters. “My uncle was a professional drummer in Cleveland and I wanted to be a drummer too,” said Farinacci, during a phone interview Friday afternoon from Cleveland. It was obviously a great choice — even though he may not have known it back then. When he was 17, Farinacci performed a festival in Cleveland, opening for Wynton Marsalis and his big band. Marsalis was impressed with Farinacci and invited him to New York a few months later to perform as a special guest with him on a live PBS broadcast. “When my high school band opened for Wynton, we got to go backstage,” said Farinacci, who has won numerous international awards and compettitions. Farinacci just released his Mack Avenue Records debut album “Short Stories,” which was produced by legendary producer Tommy Lipuma and featured performances by Christian McBride, Jacob Collier, Steve Gadd and Gil Goldstein. The band he will be performing with will be different but the music translates to an incredible live show that comes from Dominick’s experiences overseas as the first Global Ambassador for Jazz (Jazz at Lincoln Center). “We started to plan for the album four years ago,” said Farinacci. “We ended up recording the album in two days. The pre-production was everything. It was an involved and intense process and having a great producer like Tommy really helped. Video link for Dominick Farinacci — https://youtu.be/IjRbg6xr_ek. The show at South Jazz Parlor will have show times at 7 and 9 p.m. Tickets are $20.